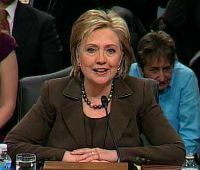 Hoping to recover deleted e-mails, the FBI has expanded its investigation into the security of Hilary Clinton’s use of a private server when she was secretary of state. The Washington Post reports that the FBI has found a second private technology company that is willing to provide the bureau with data preserved from Clinton’s account. Connecticut-based Datto Inc. helped manage Clinton’s e-mail system by providing backups. The FBI is trying to determine whether classified information was accessed through Clinton’s private server. Posted: 10/8/15 at 10:01 AM under News Story.